Cirque du Soleil and the estate of Michael Jackson have joined forces to create, Michael Jackson ONE, exclusively for Mandalay Bay. 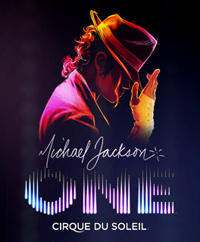 Michael Jackson ONE is a theatrical evocation of Michael’s creative genius. Guided and inspired by his music, four misfits set out on a transformative adventure. By journey’s end, they will personify Michael’s agility, courage, playfulness and love. This new production intertwines breathtaking acrobatics, innovative multimedia and artful dance with the music we all know and love.